My favorite brand of potato chips has to be Pringles. I just LOVE the crispy chips all neatly stacked in a can. My favorite flavors are the Sour Cream and Onion and the original...YUM! When we go on road trips, I typically pick out a can of Pringles for the ride as they are slim and very easy to pack. They are also super easy to eat on the road and also to pass to the children in the backseat. When I was a child, my dad would always stop at a store on the way home from church and pick up a can of Pringles. He would then divide the can up between my 5 siblings and I and this was a special treat reserved for Sundays. We so enjoyed this tradition and I remember it to this day. From now until October 31, you can send proof of purchase of any four Pringles cans and redemption form to receive their free Pringles Speaker. Visit Pringles.com/current-promotions to download the redemption form. 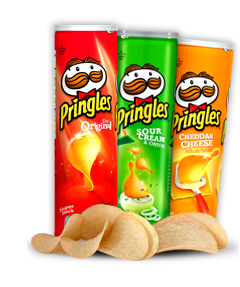 Pringles crisps are available nationwide and all traditional can flavor purchases qualify to receive speaker. Does that sound great or what? What makes this really great is that you can use your empty Pringles can for a speaker! This is sooo fun. For this review I was sent a can of Pringles (woo hoo!) and a Pringles speaker to try out. You can use this speaker with any MP3 player or similar device. All you do is put in 3 AAA batteries and plug the speaker into your player. Next, set the speaker on top of your empty Pringles can and hear your tunes resonate through the can! How cool is that? I loved using my speaker, it sure will make a great conversation piece at family picnics! The sound is very good considering the size of the speaker...I was surprised! You can take this portable speaker anywhere with you to places where traditional speakers are not available...the beach, laundromat, festivals, parties, camping, etc. Your Pringles can will not only be bursting with flavor now, bot also with music! :) What a great concept. Oh yes, I was also sent BBQ Pringles and loved snacking on them last night after the kiddos were in bed. The BBQ flavor is slightly spicy and has so many great garlic, onion and pepper flavors...they were wonderful! Today at lunch my children enjoyed some of these chips as well...they kept asking for more! If you want a free speaker for yourself, simply purchase 4 cans of Pringles, send in the required information and you will be well on your way to summer fun with your speaker! Disclaimer: I received no monetary compensation for this post. I did receive free Pringles products for review purposes. All quotes and stock photos are from the Pringles website and email. Prize is being provided and shipped by the sponsor. All thoughts and opinions are 100% mine. Love Pringles! The Sour Cream and Onions is my favorite. Thanks so much. I like the pizza ones. Jalapeno flavor served with plenty of cold Mexican beer. I love the Sour cream & Onion best. I like the Blastin Buffalo Wing. We like the original and sour cream and onion. I love salt and vinegar! Sour Cream and Onion is my favorite. I love the sour cream and onion! I love their Pizza flavor! I like the Sour Cream and Onions. The Cheddar Cheese Pringles are my favorite. I really like the cheddar cheese. My favorite is the Salt & Vinegar. I still like the Original chips the best. The original chips are my favorite! My favorite Pringles are the Multigrain Truly Original. They're really good! I like the originals the most. Honey Mustard is my Pringles of choice! I love Sour Cream & Onion pringles. I like Original. Thanks for the giveaway. I like ranch and pizza flavors. My kids fav. is Sour cream and onion. I like the orginal. It's my favorite! I love the original Flavor!! I like the original, nothing wrong with not messing with the original! The pizza ones have always been my fave. My boys LOVE the Cheddar Cheese flavor! I actually prefer the original Pringles. My favorite is the Sour Cream and Onion! My husband's is Honey Mustard. We also like Original and Cheese! I like sour cream and onion and my husband likes honey mustard! The BBQ Pringles are the the best. Pringles S30 Fldwinalt & Vinegar is our fave. Cheddar Pringles have always been my favorite. Loaded baked potato are my favorite.